Software Catalog 2.4.1 free download. Software Catalog helps keep your computer software up to date. Most applications have associated web sites where updated versions of the program are available. 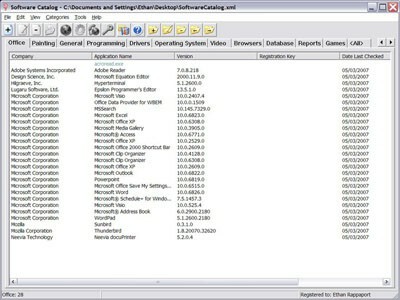 Software Catalog is a program that can manage your computer applications. Some of those reguire login names and passwords to access the latest software. This makes it quite difficult to keep track of the latest versions of all your installed software. Software Catalog brings all the necessary information for version tracking into one location. It stores application information, version numbers, registration information, application web sites, upgrade information, the date you last checked for a software update, and much more. Let Software Catalog help you keep all your software up to date. Hardware Catalog is a software application for Windows that will give you an easy way to gather and organize information about all your computer hardware. Specimen Catalog is a useful program that helps you to manage your collection of shells, butterflies, rocks, minerals, or other specimens. Recipe Catalog stores your favorite recipes and gives you detailed nutrition information. Coin Catalog is a Windows application that will give you an easy way to gather and organize information about all your coin collections. Cents Catalog 2004 was designed to make ordering, tracking sales, keeping up with the price changes, out of stock items and so on easy. Movie Catalog is a software application for Windows that will give you an easy way to gather and organize information about all your movie collections. Music Catalog is a software application for Windows that will give you an easy way to gather and organize information about all your music collections. Stamp Catalog for Windows: gives you an easy way to gather and organize information about all your stamp collections. Catalog Hot Files Pro is a utility that generally accelerates your normal computer workflow.